Nduka Ugbade’s Remo Stars finally bagged their first home win and this reducing the burden of being at the base of the log, while Plateau United led by Kennedy Boboye maintained a seamless lead on the league classification. A total of 19 goals scored, no away win and no draw. This is the first time, since the 2013/14 season all home teams emerge winners in a match day. 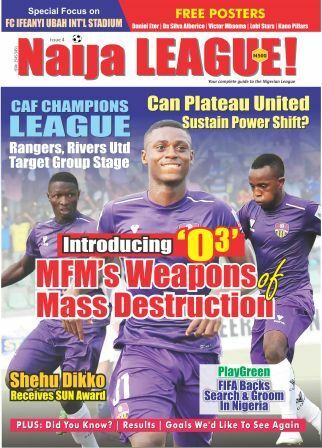 Another exciting feat to note is that of Stephen Odey of MFM FC. Odey gets into the record books as the player to score the first hat-trick of the Nigeria Professional Football League 2016/17 season. In Jos, Kennedy Boboye brought it to the big party, showing his former pay masters the stuff he is made of. A late goal by Alaba Adeniyi consoled the visitors after Benjamin Turba’s brace and Kabir Umar’s strike secured Plateau United’s third win in three games. This will go down as Plateau United’s first win over Sunshine Stars since 2003. Not many will be surprised about United’s show under the tutelage of Kennedy Boboye. Last season, he led Abia Warriors to a ten-match unbeaten run, but did not end the season well. This term, Boboye needs to be consistent. As guest of FC Ifeanyi Ubah last match day, MFM FC suffered the biggest defeat since they debuted in the league. They, however, meted same humiliation to Godwin Uwua’s Lobi Stars. Stephen Odey recorded a hat trick, while Tchato Giscard 67th minute’s goal left the visitors on the losing end. This second home win takes the Lagos side to the 4th spot on the log. FC Ifeanyi failed to pick points away from home as ABS FC maintain their unbeaten run by overpowering the Anambra Warriors courtesy of Chgozirim Metuh’s solitary strike which came in the 17th minute of the match. Rivers United did not increase the tally. With this defeat, Niger Tornadoes have yet to win a game. The Minna club are bottom of the log with just one point from a possible 9. 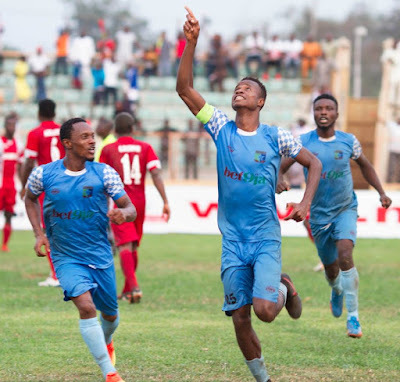 A 65th minute strike and a 90th minute spot kick was all Enyimba needed to run over visiting Gombe United. The goals came from in-form Ibrahim Mustapha and skipper Mfom Udoh. This is the second home victory for the Peoples’ Elephant of Aba who are temporarily at home at Calabar. Kadiri Ikhana led Mai Su Gida into the fray with one of his previous employers and came out victorious, as expected. Shooting Stars took the lead, but Kano Pillars came from behind to win the encounter 2-1. Bobby Clement’s stunner made the difference at the Cathedral as his side matched up against El-Kanemi of Maidugiri. Ladan Bosso’s side are bad travellers, but they made Rangers sweat for the victory. Rangers now occupy the 9th spot on the log, while El-Kanemi remains at the bottom half of the table. Katsina United handed Nasarawa United their first defeat of the season after the game ended 1-0. With two draws from two games, the Solid Miners are placed 18th in the league classification, while Katsina United, with six points, maintain the 8th spot. Abdul Maikaba’s return to Bauchi was uneventful as Harrison Madu scored in the 82nd minute to put Akwa United to the sword. This defeat means Akwa United have gone three matches without a win and they are 19th on the log. Not a good form for the Promise keepers.